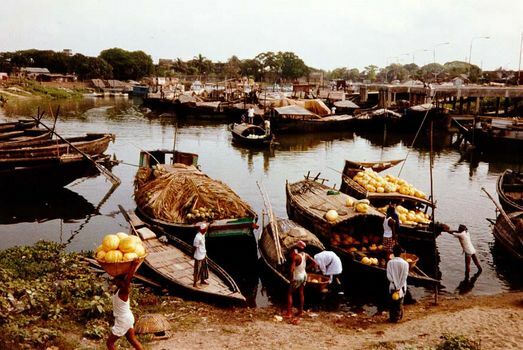 Narayanganj is Dhaka's deepwater port; Mymensingh is a hundred miles or three hours by road to the north. 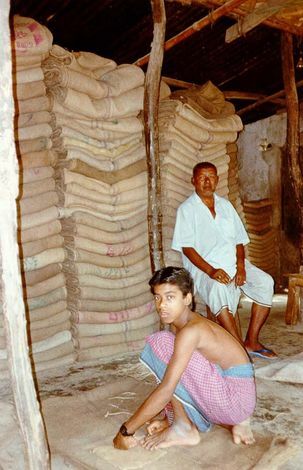 Kishorganj is the nearby boyhood home of that extraordinary freethinker, Nirad Chaudhury. Three hours to the west, Pabna is a town on the Padma River (no typo) or Lower Ganges. Call it an assortment of smaller (but not small) Bangladeshi towns. 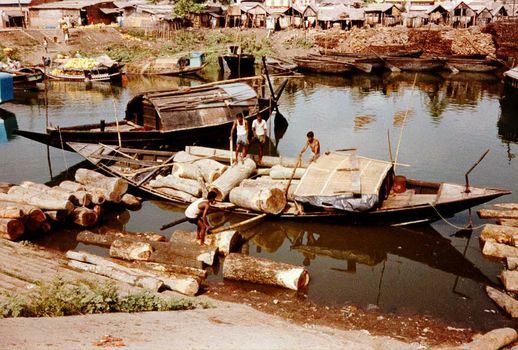 Downstream from Dhaka, Nayaranganj is the headquarters now of the Bangladesh ferry corporation, which in the colonial era was a private company that ran steamers through Bengal. Alongside the big vessels, the port also handles hundreds of tiny boats, unloaded one heavy basket at a time. In this case, the burden was melons. Not far from the harbor, this is the childhood home of Rumer Godden, whose father had worked for the old British ferry company. When this picture was taken the building was been converted to offices. The interior consists of a few enormous rooms. Judging from the paperwork stacked on the mantelpiece, the fireplace in one of those rooms was no longer in use. 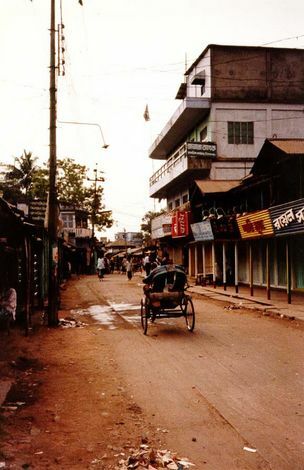 Mymensingh was once the most populous district of British India and a major jute-growing center. 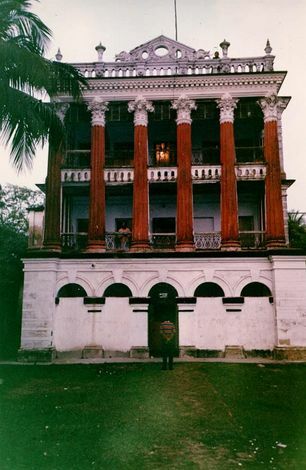 This is the Mymensingh Rajbari, literally the "government house" but in fact the home of a zamindar, or estate owner. 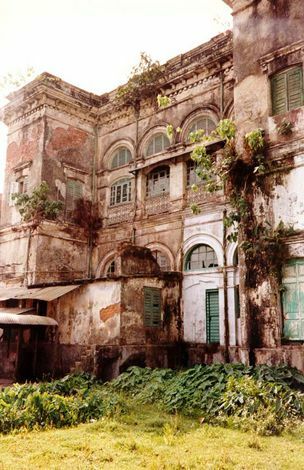 Built between 1905 and 1910, it was paid for with the rent collected from jute farmers in a neighborhood known at Muktagacha, a dozen miles west of Mymensingh. When this picture was taken in the early 1990s, it housed a women's teacher training academy. 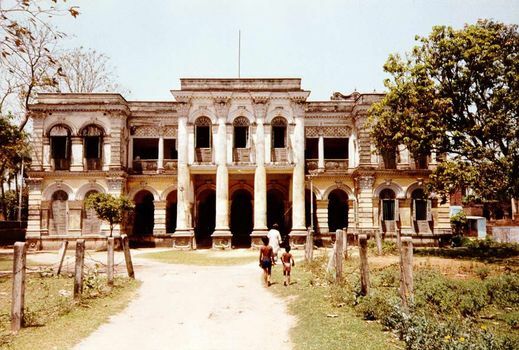 Kishorganj, southeast of Mymensingh, was the boyhood home of Nirad Chaudhuri, author of Autobiography of an Unknown Indian. He writes that corrugated sheet-metal roofing was introduced here early in the 20th century. The use of English has declined a lot since then, but not the love of cricket. A quilt shop in Kishorganj--and a study in elegance. The Taras Rajbari in Pabna, across the river from Kushtia. 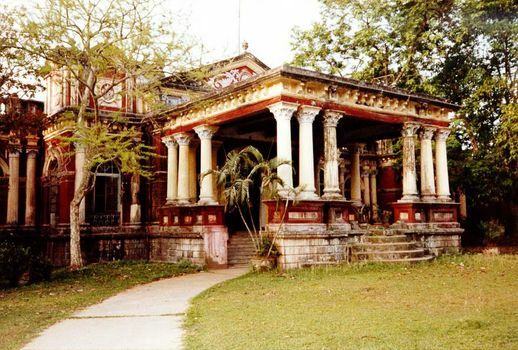 It was built in the late 19th century for the zamindar who held the Taras zamindari, the wealthiest estate in the Pabna district. 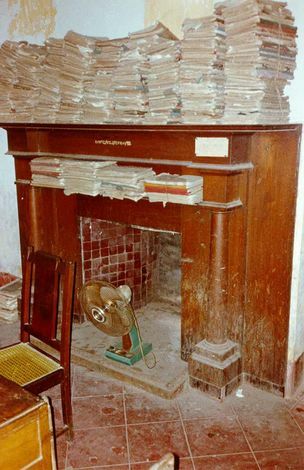 When the picture was taken, it presently housed the records of the custodian of property abandoned by Hindus who fled to India after partition. An unidentified mansion. Pabna perhaps. 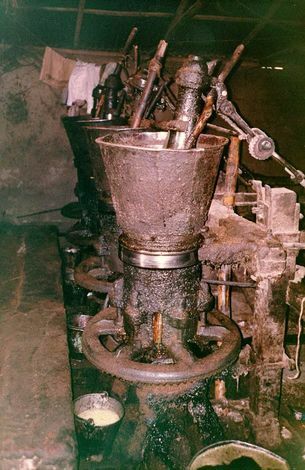 Pabna certainly: a mill for grinding mustard seed to oil. The air was very irritating to the eyes.